Local teams from the Alice area walked away champions in all four categories at the Score Red Lion Easter Rugby Tournament that kicked off for the 20th time with a new title sponsor, Score Energy Drink. 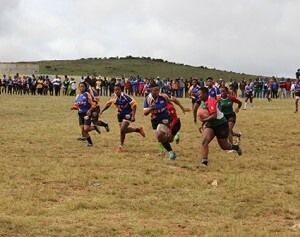 Hosted by the Red Lion Club and presented by Stormforce, an Eastern Cape sports equipment company, this annual club rugby tournament, attracted 36 teams from clubs throughout South Africa including the Eastern Cape, Gauteng, Free State and Western Cape. 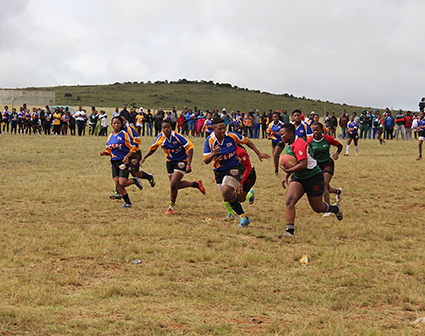 The teams comprising senior men, women and youth rugby, competed at the Nqgele Location Sport Fields in Alice. The Red Lions Rugby Club was crowned as winners of the Senior Men’s category, with the Kieskamahoek teams, Killers and Boiling Water, respectively in second and third positions. The Blue Jet team from Cape Town came in fourth. The Senior Ladies category brought Alice another win with the UFH Baby Blues winning the tournament, while the Busy Bees from Cape Town came in second. In the Youth category Alice homes sides, the under-13 Flying Eagles and under-16 Red Lion Rugby Club, both won their leagues. ”It is important to reflect on the role of sport in the upliftment of our society. The Score Red Lion Easter Rugby Tournament gave our region an opportunity to reflect on our proud rugby heritage, a unity of purpose to maintain and develop our sporting facilities and a boost to rugby development and the local economy. This event allowed our youth to dream and relate to a set of values that will shape them into the leaders of tomorrow,” says Counsellor Bandile Ketelo, Mayor of Raymond Mhlaba Municipality. As the new sponsor of this long established club rugby tournament which has taken place annually since 1998, Score, one of the country’s biggest selling energy drinks, gives credence to its commitment towards the development and promotion of rugby in rural areas. “This tournament brought the unity of our people into action. We are grateful to Score Energy Drink for sponsoring this event within our community. It is indeed rightly called the ‘unity drink’,” adds Counsellor Ketelo. For more information visit www.drinkscore.co.za. Keep up with the latest action by joining the Score community on www.facebook.com/DrinkScore and follow @drinkscore on Twitter and Instagram.